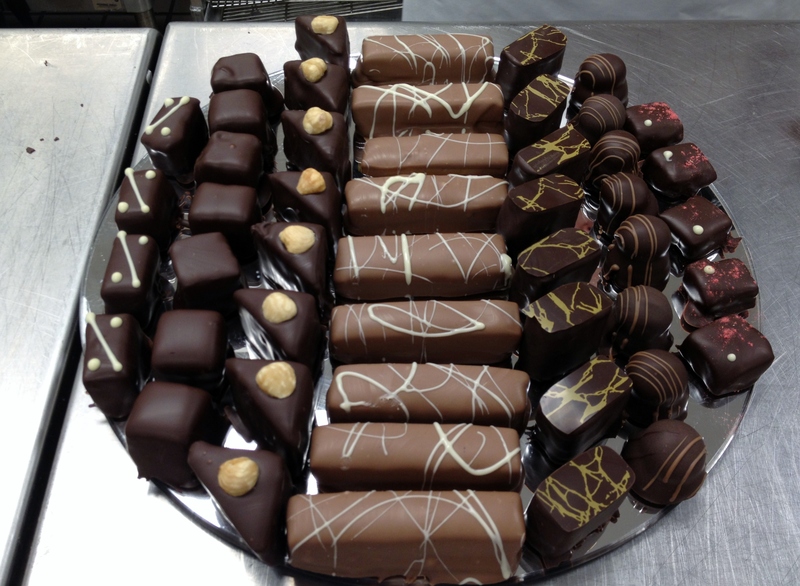 I thought it might be time for a little photo slideshow — especially since we just did another confections lab in Chocolates and Showpieces last week and ended up with trays of lovely chocolates. In Intermediate Cakes, we played around with pastillage as a medium since we have to use several different pastes in our Wedding Cake design project, and we did a buttercream frosting tasting. Very interesting to have so many different buttercream styles side by side. When it comes to frosting, it is definitely different strokes for different folks. Right now I am prepping for my final projects. Today is the first of a two day Wedding Cake design project, so I’ll get back to you about that. 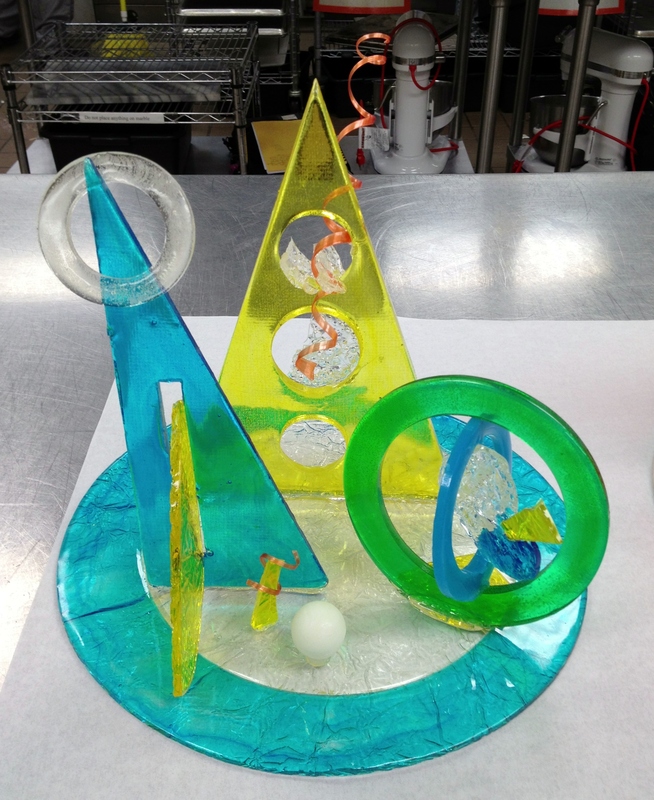 In the meantime, you can see my design draft in the slideshow, along with my design model for a different design project: my Sugar Centerpiece. Yes, I assemble models like a third grader. What can I say? The cutting and the pasting are not my thang. This is the design draft for my Intermediate Cakes project. Theme: May Wedding. Birds about to be etched in cocoa on pastillage. Experimenting with pastillage shape for wedding cake topper. A buttercream tasting — seven different recipes side by side to compare taste, texture, color, and pipe-ability. This frame is for a Strawberry Balsamic Butter Ganache (that’s passionfruit on the left for a different confection). These are macadamia nuts on dark chocolate discs piped with a milk chocolate and rum ganache. They are about to get their dark chocolate bath! This is the caramel for the Salt and Pepper bar I was making in class — right before my thermometer went haywire and I scorched the caramel — couldn’t really tell, but STILL! I have to admit I rolled my eyes when I saw this section on Illusionism coming up in class. I never really understood taking a thing that is a thing in itself and trying to make it look like an entirely other thing. I feel impatient just thinking about it — just get the thing itself, not the imposter. Why make a brownie look like a hamburger patty? Let the brownie be a brownie! It makes me want to jump into a discussion of Platonic forms. Perhaps I lack imagination, or whimsy. I can be very literal sometimes. 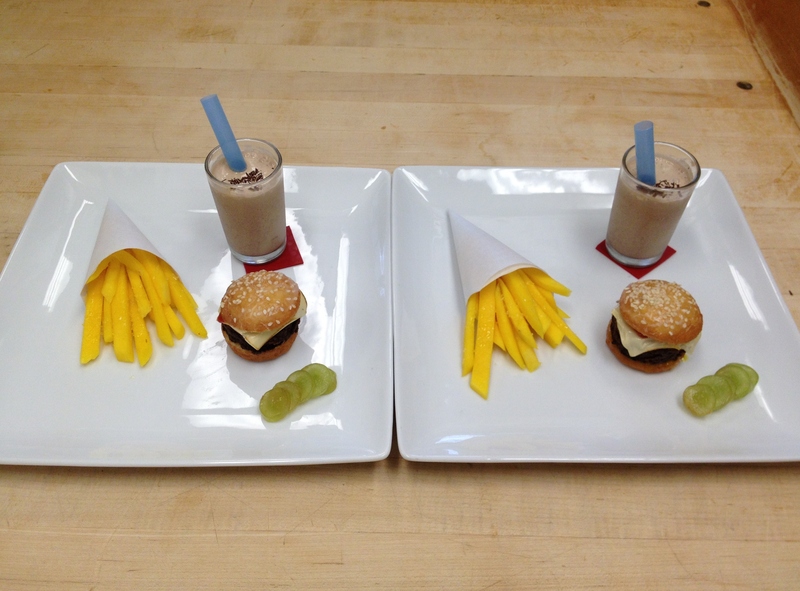 For this week’s Advanced Baking and Pastry Lab, our task was to create a dessert cheeseburger and fries. “How?” you might ask. Well, you use a brownie for the burger patty, you make mini doughnuts with sesame seeds on top for buns, you use a little tempered white chocolate for the cheese, sliced mango for the fries, sliced grapes for the pickles, and raspberry and mango sauces for the ketchup and mustard. Add a mini malted milkshake and viola — a cheeseburger dessert. That’s a lot of effort to go through to make a dessert look like a main meal, right? I agree. But, I have to say, the result was more than the sum of its parts. There was a moment of minor surrealism to bite into a “cheeseburger” and taste a brownie. I didn’t hate it. If I sound begrudging it’s because I am resistant to this type of tomfoolery. This is Illusionism. I am a Minimalist. When I design a dessert I seem to always be striving to simplify it. I want to strip it down to its elemental parts so that those parts can shine cleanly and without confusion. One of the biggest challenges for me this semester has been to design desserts for my practical exams which meet all the requirements — must be hot, must be cold, must be soft, must be crunchy, must be garnished, must be sauced (and some decor would be nice, if you can…) — and make the whole dessert able to be consumed in twelve bites or less, please, because this is fine dining. Oh, and don’t forget the cake. Whatever I am making, Chef always seems to ask me to add some cake somewhere. It’s a Minimalist’s vexation, but it is satisfying when it gets worked out. As for the “cheeseburger,” I will admit it had a certain charm when it was done. Still, I have to say my favorite parts were the mango fries — just plain fresh mango sprinkled with sanding sugar “salt” and dipped in raspberry “ketchup,” and the milkshake — which was an actual milkshake. What can I say? I like to keep it real. Sugar has been getting a bad rap lately for not doing a body good, but I’ve found an unexpected way to enjoy it: sugar centerpieces. Off all the mediums I’ve worked with this semester in my Chocolate and Showpieces class, sugar is by far the coolest. Remember the chocolate heron amenity (it alternately cracked and melted)? Remember the dead dough Happy Owl Baking centerpiece (too many things went wrong with that to bother mentioning)? Well, I can Dear John both of those mediums now because I found Sugar. Sure, sugar is dangerous (boil to 340 degrees), fickle (you don’t even have to be touching it and it could decide to shatter), and it’s a little clingy (it’s sticky and can pull a stray shard or sugar crumb to it from across the room), but it’s also mysterious (what color will it be? I have no idea, just pour in a little dye and see), versatile, and very beautiful. Sugar is a fascinating mix of fragility and strength. It could crack on you if you look at it wrong, but the sugar bond itself is also so strong that you can solder seemingly incompatible pieces together into acrobatic positions you can’t believe would hold, but they do. That, coupled with sugar’s ability to take almost any color from clear to brilliant jewel tones, gives it a design versatility that is, so far, unparalleled. If you want to see tension, watch a sugar showpiece competition and know that the sugar artist is probably holding his or her breath since all the careful planning, design, execution, skill, and focus still can’t overcome the element of chance present in sugar. The assembly could go like clockwork, or the breeze could blow, or someone could slam a door, or — well, you get the idea; it’s a gamble. You just take a deep breath and go for it. So, if you can stand the heat, sugar might be your jam. Preparing the sugar for pulling. Pulling sugar for ribbons and that sugar is CRAZY hot for the 10 seconds it is pliable. Some very clumsy stylized petals. Dang that sugar is hot! You know what they say about time flying…it’s mid-April which means I’m just about one month out from Final Exams for the Spring semester. It also means that my time in Maryland is coming to an end; I am measuring in weeks now instead of months. Granted, there are enough weeks left that “months” is still plural, but barely. I’ve been thinking about the things that I haven’t done: I should have gone to Washington, D.C. more often, I should have gone to Manhattan more often. I never went back to Mount Vernon (George Washington’s house) even though I bought the annual pass and pledged in an earlier blog post to recreate the menu from the “Hoecakes and Hospitality” exhibit…and Monticello still calls to me. So does Charleston, Savannah, and Miami. Ah, well. There are the things I should have done, and then there are the things that I actually still have to do and I can sum those things up with two words: study, and pack. I’m past critical mass and into the downward swing of this adventure. Soon it will be time to wrap up one phase of my life and drive due west from where the sun rises to where the sun sets: back to Northern California. But, before I change frequencies, I have things to do and people to see. I’m in the throes of designing all three of my final exam projects: a 3-tier wedding cake, a tropical themed plated dessert, and a sugar showpiece with confection. 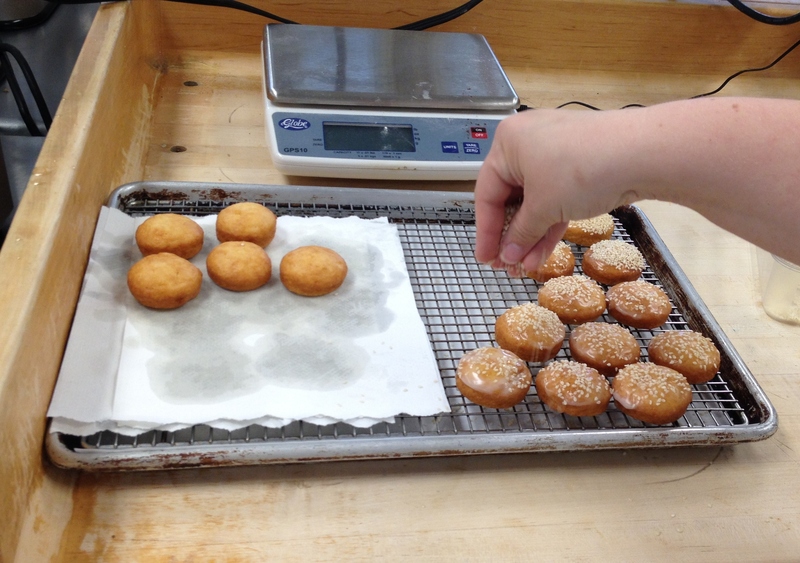 These last three classes are very different from my other baking classes. Those classes were all about production, organization, and time management. We made what the chefs told us to make. In comparison, these classes are design classes. I have to actually produce the designs, of course, but it turns out that the design component itself takes about a million hours more than you would imagine — certainly I spend exponentially more time designing the piece than I would ever spend making it. For every timed practical that I have 3 hours to produce I’ve probably spent at least 15 hours designing it, scaling it and testing it — probably more since I over-think everything which means my research is exhaustive. And, I mean that in the truest sense: I am exhausted by the time it’s done. So, these last three projects will be very much on my mind from here on out. It will be a dash to the finish line.